Ck Ledesma is an artist working out of VAR Gallery and Studios in Milwaukee, Wisconsin. Located in the eclectic Walker’s Point neighborhood, this multi-use studio space and gallery is quickly becoming a hub of activity in the local arts community. Ck’s vibrant abstract work derives from his passion for social connectivity and the color palette of Puerto Rico. By taking major cues from his background in dance and installation, he allows his work to fluctuate seamlessly between mediums and genres. After being shown into his studio, we jumped right in, beginning with some clarification of his involvement with several arts organizations. JW: What art organizations have you been involved with? CKL: I am involved with Artists Working in Education - AWE. I interned at the Portrait Society Gallery. I’m also involved with MARN, the Milwaukee Artist Resource Network. I just became a part of MARN. JW: What does a membership at MARN entail? CKL: You sign up and pay a fee, you contact people - they have portfolios and profiles and you do visits and whatnot. Each year they choose and hook you up in a program with established artists – upcoming new artists, kind of like mentors through their program. I just learned about it, that’s why I signed up, it’s a great way to get out there. JW: That’s great. Did you also work with the Cream City Foundation? CKL: Yes, I donated a piece to the Cream City Foundation; they are going through some reworking. They have a new president and a friend of mine reached out to me because they were looking for art – the foundation is queer-based organizing and fundraising for queer issues and artists in Milwaukee. I said I’d donate a piece. 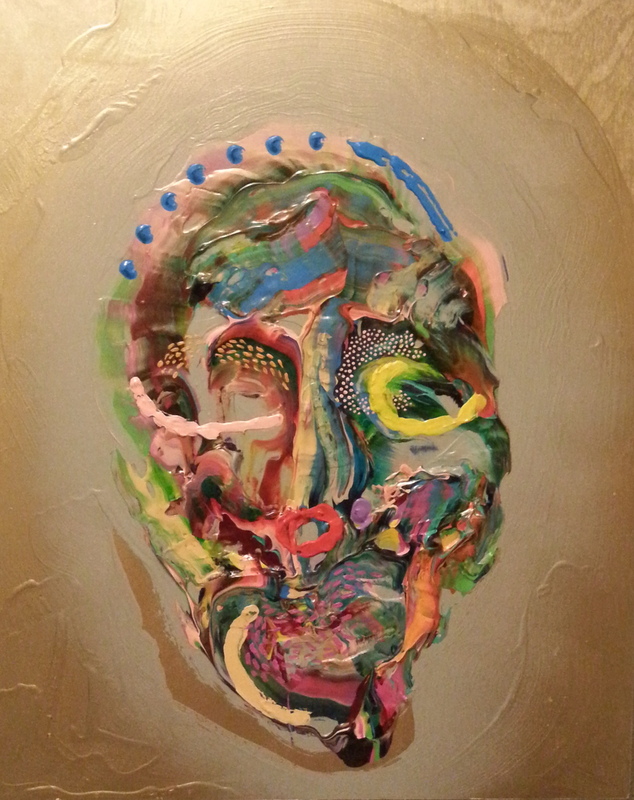 It was for an auction, three weeks ago, [the piece] was one of the masks I did for the Pfister [Hotel]. Also, I did one about a month ago for the Victory Garden Initiative in Riverwest; that was an awesome silent auction. Another project I did was with Beintween, because they did the Artery [outdoor linear exhibition space and park], I did a dance/sculpture and performance piece with them there. JW: Tell me more about the dance-focused installations. CKL: That was my second dance and paint installation work, that’s where all the identity-based things came from. The Artery was looking for multicultural integration within the space. My work has always been about identity, especially the color palette - it is so Puerto Rico, to me. When I grew up all of the houses were these vibrant colors – but I didn’t fully realize my work was about identity until I left the college years and the Artery outdoor space was asking for submissions [for art installations]. I submitted a program proposal of dance representing cultures on top of paint that also creates an abstract work. Culture is an abstract thing, identity is an abstract thing – that was my submission, where we would have 3 different performers do contemporary dance, each having their own solos wearing a different mask that represented the community that lives in that area. It was Hmong/Asian, Latino – mostly Puerto Rican, and African American. We did a piece where we threw paint on plywood and each dancer had a turn with their mask. It invoked the integration of their area and their own culture. After that we took the pieces of plywood and turned them into a totem pole, which tied into Native American culture. JW: It comes naturally to you to push boundaries between 2D art, 3D art and performance/installation. Do you feel that that project was the apex of all those things coming together for you? CKL: Most definitely. That was the one performance that I feel reflected that. I have a background in theater and the installation-based work is a kind of theater. It’s props and moving people through space. That was the installation that accomplished the goal of uniting everything that I have done into one unit. JW: How does your upbringing in Puerto Rico influence your style? CKL: Oh God, a lot, tons. It’s color, one of the main things, and movement. I feel like the landscape of Puerto Rico – not only the natural, but architectural, is an influence. The weather - I still think about that when I’m in Wisconsin. Yikes. CKL: Again, the color palette [is the focus], and now the thematic aspect of my work. I’ve gone into a mask-making idea. It’s a push and pull because Puerto Rico is such a crazy mix of Spanish, White conquerors, Native American Indians - Tainos, and then black African slaves. Puerto Rico was one of the first places that Christopher Columbus came to, and he conquered and colonized it. There’s a crazy different religious thing that manifested in Puerto Rico during that time that my family is still involved with, [the religion] Santeria. It’s something I still have in the back of my psyche for some reason. I was never brought up in any sort of religion, but I did see and experience it firsthand – deities that the African slaves [brought with them] had to hide behind Catholic Saints, like Oshun or Yemaya, or Elegua, or Chango. That is still a part of me that influences my work so much because of the way that I mark-make, the color, and the way that my style is iconic. Puerto Rico is heavy on me. I love it, and it’s not something that I could put aside. JW: That’s where the masks came from? CKL: Where the masks came from, that’s another story. I was conflicted with the term “person of color” and what does that title mean for me as a “person of color”. I started doing some investigation of that and person of color just means that you are simply not of white descent. That could be anybody and everybody that is not white. That is unsettling, using a term so loosely. I get the concept but at the same time it negates who you are as a person. If I say I’m a person of color, I am also Puerto Rican. I am also Latino; I am also queer. I am also all of these other things that the term person of color does not encompass; it’s too vague. I’m sure that an Asian female could also say I am of color or an African American person, or Middle Eastern, but it’s something that is just an umbrella term. What does it mean to be a person of color and for me, it was not the shade of my skin but my experiences. Places where I’ve been, my upbringing, my background, my studies and things that I’ve created. There is this huge mask-making culture of Puerto Rico called vejigantes – they are these masks that originated in the 15th or 16th century to scare people to go back to church. They are demons, and they are kind of self-righteous. The term person of color, it’s just simply a mask that we use. You are of color – you are ‘the other’ or different. I was weaving myself into the mask making and seeing where it goes, because it can go in any direction. JW: What is the Self Portraits as Isms series, as a concept? CKL: I went to Paris with a study abroad through MIAD [Milwaukee Institute of Art and Design]. While we were there we had to select a subject and create work based off of our subject and create an extensive 20-page thesis. I choose the Pompidou, it’s the museum of contemporary art in Paris, and its surrounding areas. This museum is gnarly – it is ridiculous. It has all of the piping and inner works that you would need in any building on the exterior. All the water vents and air pipes and electrical stuff is on the outside of the building. It’s ridiculous, and the area around it too – the other buildings are like an epicenter for contemporary youth and rebel ideology. There is a lot of graffiti and the energy around that building, it is extremely contemporary. When I went to the museum the artist JR had an installation there where he had a photo booth that was about 2 stories high. You would go in and take a photo of yourself, like a two by two but they print it as a ginormous size – I think it was 4 foot by 3 foot. Portraits as Isms came from that experience of going into the surrounding areas of Pompidou and being part of JRs installation work, and having these images. I created a collage series that represented my growth and Paris. I made a book with all the images and it starts as black and white, and there is a progression [of color]. It also talks a little about the history of Paris, and being an arts capital of the world. It starts as bland and the norm and progresses into this insane, crazy, contemporary place. JW: Let’s talk about your newest work, the sculptural paintings. CKL: Oh, yeah, those little nuggets. They came from the experience of food. Identity is a lot of things aside from what you look like. Food and dance is a part of my identity. There is this thing called limber that is at a little mom-and-pop shop [in Puerto Rico], or maybe your grandmother makes them, and she sells them for a quarter. It’s a dessert, basically fruit juice, frozen. The person selling it makes the juice at home. That is a process of it’s own and most of those fruits are cultivated in the backyard of the person who is selling them. You freeze it and put it in a clear plastic cup and there’s a specific way of eating it. In my upbringing I would ride my bike to doña Anna’s house and it was a quarter to buy a passion fruit limber or coconut limber. I have always been interested in paint as a material not only to make 2D objects, but also as a sculptural entity. I started pouring acrylic into these plastic cups in different colors and layers that represented flavors and tastes. Paint can be empirical, it can be an experiential thing, and that is where the limber process for the sculptures came from. That jumps into my other pieces, where I was interested in the surface as a place to engage senses more than just visual – you could touch it or taste it or eat or smell it. It’s still there, related. JW: Your new work plays into your interest in communal experiences - in your childhood with your neighbors and now as being a part of various organizations. Additionally, you have a background in teaching. CKL: Most definitely. My proposal [as a finalist] for the Pfister [Hotel Artist in Residence Program] was based on that. I wanted to create the studio space to be a place of communication and experiences where people would come in and talk about their background and how they identify as individuals. My proposal talked about using different methods to facilitate that goal - anywhere from a paper survey to dinners – people could come in and have sit-down dinners and talk about their identity with me. It’s definitely all about performance, experience, and sharing too. JW: What part of your current jobs or activities do you feel has the biggest influence on your work right now? CKL: To pay the bills, I bartend, and that is an experience in sharing. Not only am I giving you a service, but also we have constant communication. It’s like being a psychologist for a ton of people. They come in and explore what they need and what they want. It’s the same thing as teaching, you go in there and you are going to teach them but at the same time you are going to be involved with their personal lives. As a teacher you might have an influence into what is right, or your own personal “right”, I guess. It’s weird because I feel like my studio space is always with me, my practice is always outside of the studio. When I come in to make something, it’s all of those experiences from when I taught or hung out with a person and I think, “Maybe I can bring this into my 2D or 3D work”. JW: Social interaction is the huge influence. CKL: Exactly. That piece specifically [gestures at large painting on the wall] has a lot of that to me. It’s different universes interacting with each other, intertwined. In an interactive way, through mark-making, I try to bring back a survey of all the marks I’ve done through out my life. Spray paint – and there’s crayon and colored pencil and acrylic and all these things that are intertwined and touch each other, abstractly. JW: Anything up and coming? 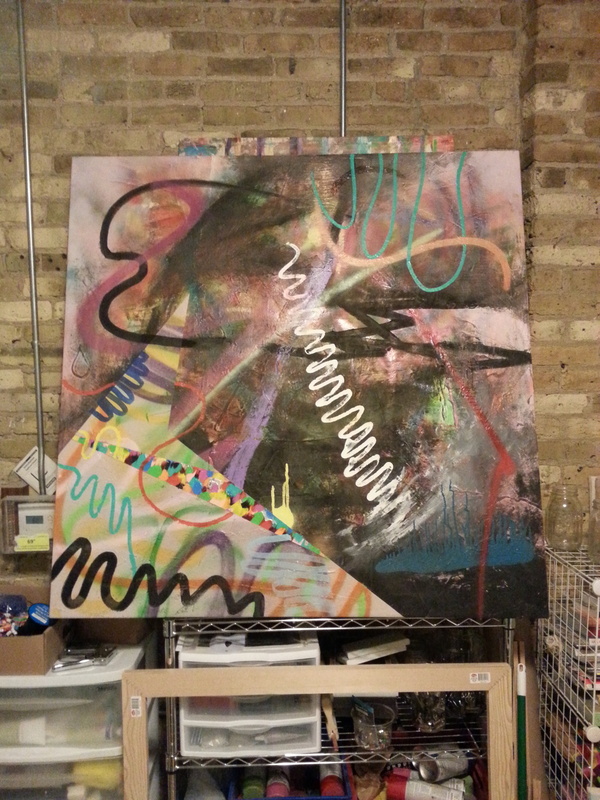 CKL: Yes, I’m going to have a show at Riverwest Public House coming up April 11th and then the 30x30x30 show [at VAR Gallery] and then I’m working with Kim Loper doing an installation-based exhibition here [at VAR] January 25, 2016.